What is the definition of the ‘perfect bass’? When you turn the sound on and those cones of the components start to tremble back and forth with every wave, when low-frequency notes make a smooth but deep “boom boom” sound without any distortion or unpleasant noise, that’s when you know that you’re experiencing the ‘perfect bass’. And when you experience this in your car, you can officially claim that you’re an honorable member of the “Car speaker master race”. You can easily become the owner of the best stereo system with pleasant bass quality if quality woofer components are already included in the system; but heart-beat increasing, goosebump giving bass experience can be provided only when a high-quality subwoofer is added with the components. 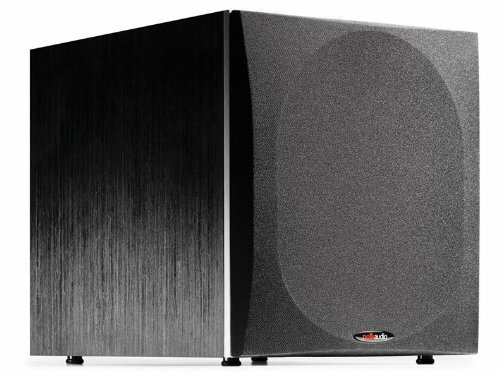 A quality subwoofer speaker is the master of enhanced low frequency’s limpidity. But sadly there are always little glitches here and there which turn your satisfaction into misery within a short amount time. This often happens when your speaker starts giving an excellent result at the beginning but wears out pretty soon due to poor construction or you have to deal with transitory speaker since most quality subwoofer speakers are too expensive. We don’t blame you for that, adjusting the quality with the budget often leads us to these mistakes and they can’t be always avoided. But as we have quite a good idea about best speakers in the current market, we can assure you of giving the proper guidance. Looking for the best 12 inch subwoofer within a reasonable budget? Polk Audio PSW505 12 Inch Powered Subwoofer promises you the bass quality that defines the word ‘best’ with every wave that hits the cone. In fact, Polk PSW505 Subwoofer is currently one of the best selling subwoofers in the market. Polk Audio Inc. is a well-known brand for quality speakers and amps in the market, and Polk Audio PSW505 Subwoofer is doubtlessly the Top Rated 12 Inch Subwoofer of the company. Polk Audio PSW Series psw505 is the master of potent bass with its built-in 300-watt RMS amplifier. The speaker design follows a different structure with Slot Load venting which results into potent and plucky smooth bass. Stiff MDF construction with thick front baffle blocks enclosure panel resonance, the utmost reason behind bass distortion: another reason to call it the best 12″ subwoofer. Features high-powered woofers for stronger vibration and shaking bass rhythm. Comes with controllable low-pass crossover to adjust bass level. Manufactured with Hi-Roll surrounds for longevity. Features auto on/off circuit that can be controlled with input signal transmission. In short, Polk Audio PSW505 12 Inch Powered Subwoofer single black is packed with all the appealing features to be called the best 12 inch subwoofer speaker and that’s why it still possesses a respected position on the best-selling list. The features are discussed in detail below for customer convenience. Polk Audio PSW505 features big slot load vents with smooth wood veneer finishing. The large slotted vent takes out the racket pitch and produces clear bass. Without any obstruction, the bass is more energetic and more rumbling than average subwoofers. The subwoofer speaker is built following MDF construction with 1 inch thick front baffle to prevent enclosure panel resonance for distortion-free sound. 12 inch subwoofers are the best car subwoofers since they feature 12 inch long throw driver that improves the system linearity and maintains the sound distribution thoroughly among all the components. The large hi-roll surround ensures longevity with huge excursion. Klippel Optimized Long Throw Woofer is included in the speaker. Best Powered Subwoofer is packed with adjustable control of volume, low-pass crossover and phase switch. These controls allow you to discipline the harmony in the whole car stereo system. Another great feature of this Polk speaker is automatic on/off switch. Instead of pushing buttons to control the power, this speaker works with input signal transmission. With a signal’s appearance, the speaker turns on; when there’s no signal, the system shuts itself down. Polk audio psw series psw505 12 powered subwoofer single speaker comes with unfiltered LFE input and low pass filtered subwoofer output jack. The speaker features 5-way inputs and outputs with binding connectors. Polk Audio PSW505 12-Inch Powered Subwoofer is magnetically shielded so that it doesn’t create any distortion on a video device next to it. The speaker works with frequency response of 28-125 Hz (-3dB) and continuously variable 60-120 Hz crossover. Q: How many volts can it handle maximum? Q: Can I connect the subwoofer to a stereo? Q: Can you use it with power load above 200v? Q: Does it built in a power cord or need to buy separately? Q: how can i connect this to my computer? If your computer has a good audio output, than you can connect it. You may have to use a splitter if your pc don’t have sub output. Q: What year is this model? This item came out in 2005. Q: Can i connect this to my computer? Yes, You can If your computer has a high level audio output. Polk Audio PSW505 12 Inch Powered Subwoofer comes with divine wood veneer finishing and large slot load venting to provide with the best bass. Its unique combination of compact MDF construction and adjustable controls with low pass filters makes it the best 12 inch subwoofer for your budget.